And thanks to a new generation with new ideas, it's not over, either. PORTLAND — The family-owned Dolan Flavoring Co. has survived the Great Depression, World War II, the rise in popularity of cake mixes in the 1950s, and many family tragedies. After 113 years, the secret formula for its most popular product is still a secret. Jack Dawson isn’t about to drop the ball on his family’s business now, even though few Mainers living in 2019 have ever heard of it. “This is one of the oldest businesses in the state, and probably the least known,” said Dawson, a retired football coach and educator in Portland schools, former Portland city councilor, former mayor of Portland, and maker of vanilla flavoring. Make that guardian of his grandfather’s vanilla flavoring, because this story has as much to do with Dawson’s family history as it does a simple ingredient for chocolate chip cookies. Dolan’s once dabbled in all kinds of flavorings – a lemon extract, for example, and a maple flavoring made with, of all things, fenugreek extract, coffee and vanillin. But it’s the company’s Mount Williams Original Vanilla Flavor, a non-alcoholic imitation vanilla, that has stood the test of time. The company now makes only two products: this imitation vanilla and, for purists, Autumn Lane Pure Bourbon Vanilla Extract. At its peak, Dolan’s products were in grocery stores all over New England, including Hannaford and Shaw’s. Now just a handful of clients are left, mostly smaller grocery stores lured by the old-fashioned packaging and a couple of chocolatiers who have fallen in love with the flavor. Last spring, Dawson recruited Gagne, his wife, and their two sons – the boys are the fifth generation of the family – to gradually take over the reins of the company he just can’t let go of. They are working together to modernize it – selling bottles online, establishing a presence on social media – while at the same time trying to preserve the business’ old-fashioned charm and the legacy of Dawson’s grandfather, Harry Dolan. Harry Dolan never went beyond the eighth-grade. His father was a railroad man who went bankrupt, so Dolan took to the streets, trying to find a nickel and dime wherever he could to help support the family. When he was old enough, he joined the Army, becoming an apothecary’s assistant during the Spanish-American War. When Dolan got out of the Army, he went to work for Schlotterbeck & Foss, an apothecary shop in Portland that later got into flavorings. (The company is now located in Westbrook and focuses on specialty foods and flavorings.) Eventually, Dolan decided to go into business for himself and opened an ice cream shop in Old Orchard Beach. When that burned down a year or two later, Dolan moved his family to Portland and bought a house on Williams Street, where he put an addition on the barn and made it his flavoring workshop. Not to mention that pure vanilla extract costs significantly more, and the process to make it is “very labor intensive,” Dawson said. 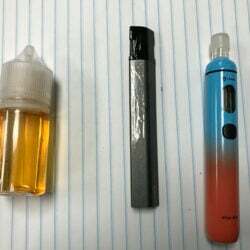 A 6.75-ounce bottle of the imitation vanilla flavoring sells today for $12.99, while a 5-ounce bottle of the extract, which Dawson resurrected after Dolan’s death, goes for $24.99. Maine food historian Sandra Oliver said vanilla became much more popular during the mid- to late-1800s, though she’s not sure why. “Vanilla kind of muscled rosewater out of the scene,” she said. Like many other Mainers, Oliver has never heard of the Dolan Flavoring Co. or Mount Williams Original Vanilla Flavor. But she added that, at the time Dolan started his business, it wasn’t unusual for small food producers to make lots of their own products. Bakers made crackers, millers produced different kinds of flours. “It just seems to me there was a much wider choice of everything,” she said. 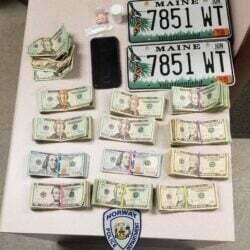 For Dolan, business boomed during Prohibition, which was Maine law when he started his company and lasted until 1933, because manufacturers had a hard time getting alcohol to make extract. Mount Williams became a staple in many Maine homes, Dawson said. Then tragedy struck, more than once. Dawson, his mother and his siblings came to live with his grandparents when he was 7, after his father, a banker, died of a heart attack on the eve of World War II. Dawson’s mother, who was suffering from bone cancer, died soon after. Dolan had put all five of his own children through college during the Great Depression. Now he had a second family to take care of, at a time when the economics of owning the business couldn’t have been worse. While Dolan traveled around New England and upstate New York making sales, Dawson stayed behind and, for 25 cents an hour, cleaned the whiskey barrels that stored the vanilla, and unloaded truckloads of supplies. He bottled vanilla by hand with a hose and plunger. Sometimes Dawson tricked friends into helping by bragging about how much fun the work was, just as Tom Sawyer recruited his friends to help whitewash a fence. Dawson also labeled the bottles and packaged them for delivery. He’d deliver the vanilla himself, down to the warehouses on Commercial, Cross and Union streets in Portland. Dawson now views these years through an adult lens, realizing how hard it all must have been for his grandparents. Dolan died in 1970 at age 93. Jack Dawson, who was handling his grandfather’s estate, began informing Mount Williams customers that the business was closing. Then the grocery chains started calling; customers were asking for Mount Williams vanilla, they said, but the stores had run out. Dawson re-hired an employee to take care of the bottling and production tasks, and he managed the business himself. Dawson coached football at the time, and says it was tough juggling the two jobs. Jack Dawson with vintage bottles and labels from Dolan Flavoring Co., one of Maine’s oldest surviving businesses. 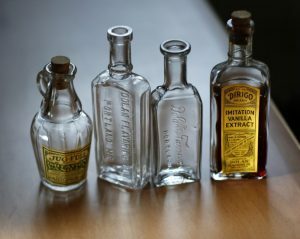 Vintage vanilla bottles from Dolan Flavoring Co., one of Maine’s oldest surviving businesses. Since 2004, some of the processing and packaging has been done at Pemberton’s Gourmet Foods in Gray. A buyer purchases the ingredients, then Dawson, following Dolan’s formula, mixes them into a concentrate. Pemberton’s adds water and helps with packaging, but the family still labels every bottle by hand. Today, the products are mostly for sale at small grocers such as Pat’s Meat Market and Rosemont Markets in Portland, H.B. Provisions in Kennebunk, and Savage Brothers Country Store in Sunday River. The vanilla is no longer stocked in Shaw’s, nor Hannaford. Two local candymakers, Len Libby Candies in Scarborough and Wilbur’s of Maine Chocolate Confections, based in Freeport, buy Dolan’s flavorings as well. 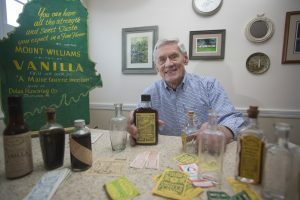 Andy Wilbur said his company has used the Autumn Lane vanilla extract for more than 25 years, not only because it’s a century-old local product but also for its flavor. Wilbur’s uses it in at least a dozen products, including caramel. “It provides kind of a unique and robust flavor profile in the caramel,” he said. Dawson himself is now in his 80s. The clock is ticking. So last spring, Dawson approached his nephew, Mathieu Gagne, about taking over. Gagne, who lives in Wakefield, Massachusetts, is CFO of a software company, has an MBA, and has long wanted to be an entrepreneur. But what drove him to agree to the plan, Gagne says, is his interest in keeping the family company alive. He and his own family, including wife Christina and their two sons, started out selling the vanilla at local bazaars and fairs, and they’ve now got a Facebook page and Amazon account. Eventually, Gagne would like to add back some of the old flavors Harry Dolan created, and resurrect the use of old whiskey barrels. Gagne’s 11-year-old twins, Marc and Charles, have already dived in, making adorable Facebook cooking videos and delivering vanilla locally to fairs and to online buyers on their bikes. As for Dawson, who still enjoys a splash of vanilla in his coffee or tea, he says his dream is to open a storefront on Commercial Street in the Old Port, where Harry Dolan’s first shop was located. It would be filled with barrels of vanilla, from which customers could fill their own bottles, and would also sell fudge, cookies, ice cream and vanilla-scented candles. Dawson remains modest about his own role as he turns the 113-year-old business over to his nephew.